At the Edible Schoolyard Project, we love and celebrate the extraordinary generosity of our community. Our community members enable our programs to thrive and grow by giving gifts of time, money, expertise, care, and enthusiasm. We'd love you to join us! This page details how to visit or volunteer. We welcome all visitors to our Edible Schoolyard Berkeley program. Our garden is open to the public on weekends and outside school hours (after 6:00 pm) on weekdays. We also conduct public tours, private tours, corporate volunteer days, and press visits. On the first Thursday of each month during the school year, we offer a free tour of the Edible Schoolyard Berkeley. Public tours begin promptly at 9:00 am, last about two hours, and are a terrific opportunity to see our program in action. Guests must register ahead of time. Select a date from the list below to register for an upcoming tour. Please note, public tours do not occur during the months of June, July, August, September, and January. In April, the public tour takes place on the second Thursday, as our office is closed the previous week for the spring recess holiday. While we hope that the public tour meets the needs of most visitors, we do consider requests for private tours. We give preference to visits from educational organizations. Private tours are typically 90 minutes and cover the overview, history, curriculum development, and current practices of the Edible Schoolyard Project, as well as class observations when appropriate. These tours provide an opportunity for a specialized focus and more Q & A time between guests and the tour lead. We ask that all private tour groups pay what they can, and suggest fees of $10 - $100 per person. The Edible Schoolyard Project is committed to providing support and ideas to educational organizations and groups. Your donation supports staff time and resources to ensure we can share our work with you and other organizations working to uplift the ideas of edible education. We do not accommodate private tours on weekends, our operating hours are Monday through Friday from 9:00 am to 4:30 pm. Please submit your request at least 3 weeks prior to your proposed date to ensure proper stuff coverage and availability. We can accommodate private tours every month of the year except June when we are busy preparing for the Edible Schoolyard Summer Training. Learn more about our training program. Our tours involve walking and standing for extended periods of time. If you or your group have any access needs, please let us know in your tour request or registration. Volunteers are integral to the success of our program, enriching and enlivening our daily work. Our volunteers ensure that all students have the opportunity to connect with an adult and demonstrate to our students the caring and commitment of their larger community. Classroom volunteers at the Edible Schoolyard provide vital assistance in helping classes run smoothly and ensuring that all students have the opportunity to connect with an adult. Additionally, before or after each class volunteers aid Edible Schoolyard staff in the daily tasks of maintaining a school kitchen and one-acre organic garden. We require that all classroom volunteers attend one volunteer training session, and participate in one regularly-scheduled garden or kitchen class throughout the semester, for a total commitment of two hours each week. We place our classroom volunteers once at the beginning of the Fall Semester, and once at the beginning of the Spring Semester. If you are signing up to volunteer after the start of a new semester, you will be placed on our volunteer waitlist until the beginning of the next semester. Please attend a New Volunteer Orientation with the Berkeley Public Schools Fund before contacting us to volunteer. The Edible Schoolyard always welcomes volunteers to help with independent garden work and maintenance of our one-acre organic garden. Infrastructure experts work independently to maintain important parts of the Edible Schoolyard garden and should expect to spend at least one hour per week maintaining their designated area of the garden for an entire semester. If you are unable to commit weekly but are typically available during school hours, we can still use your help! 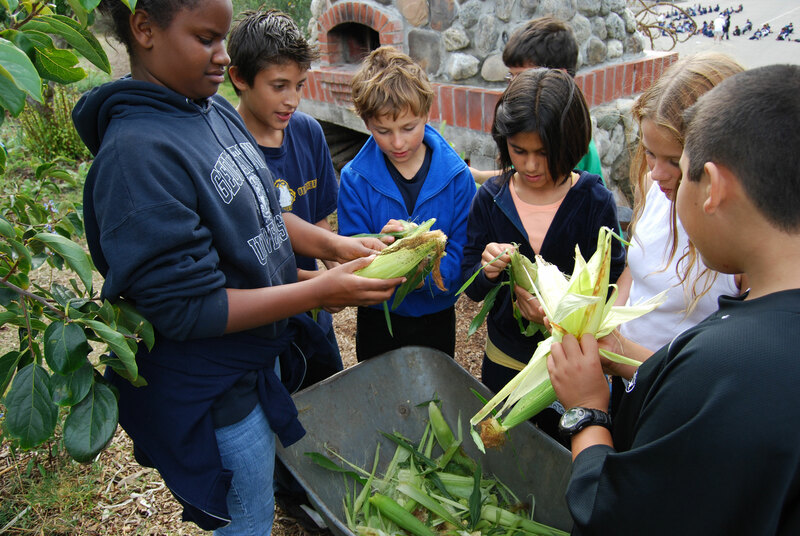 Even though our garden maintenance volunteers do not work directly with students, we require all volunteers to be cleared by the Berkeley Public Schools Fund before joining us in the garden. Please attend a New Volunteer Orientation with the Berkeley Public Schools Fund before contacting us to volunteer. The Edible Schoolyard facilitates volunteer work days for corporate teams of up to 25 people. These half-day long experiences include a private tour of the Edible Schoolyard, garden and kitchen centered team-building activities, and meaningful volunteer work in our one-acre organic garden. We encourage corporate teams to donate what they can; in addition to the valuable labor of their teams, we request a minimum financial contribution of $1,500. To schedule a volunteer work day please fill out our private visit request form. First things first! Please attend a New Volunteer Orientation with the Berkeley Public Schools Fund before contacting us to volunteer. All of our Edible Schoolyard Berkeley volunteers must be certified to work with public school children before beginning their commitment. Before volunteering at the Edible Schoolyard, you must attend a New Volunteer Orientation with the Berkeley Public Schools Fund to become certified.